So how do you plan an intervention? Well, the answer is: With the help of an addiction interventionist. It is difficult to know what to expect from an intervention, since every person facing a substance abuse problem reacts differently. There are three main goals of intervention. The first is that it’ll teach you how to identify the problem. Second, it will help your loved one who has an addiction problem seek treatment. And the third is to establish follow-through consequences. Here is a short guide on how to conduct an intervention. First of all, an intervention should not be attempted without the guidance of a professional, so the initial step in the process is to find and meet an intervention specialist. These professionals will teach family members about the problems of addiction, and coach them on the intervention steps that will be necessary, and they will also help them conduct the intervention itself. Second comes the process of planning, and it is one of the most important steps that should never be skipped. 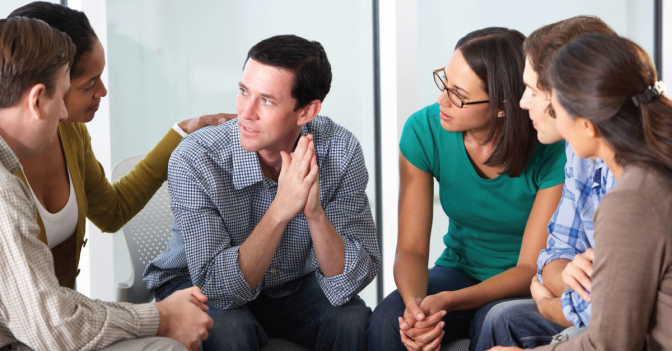 During this stage, a group of loved ones meet with the intervention specialist in order to learn about the process, and to learn what to say and how to say the right words to the addicted family member. When planning an intervention the family members should determine a time a place for the intervention, and they should practice what to say. They will also need to decide what to do if their addicted loved one refuses to quit drinking or taking drugs. Suggested consequences of this result can include severing financial and emotional support. The goal of this step is to make the addicted loved one accept that they must put an end to their substance abuse. After the planning comes the intervention itself. During this process, the addict is confronted in a loving and respectful manner about his or her substance abuse. The members of the confronting group will point out specific examples that prove that a problem exists. They will give the person a choice between quitting drugs or alcohol, and losing their support. During an intervention the loved ones of the addict will try to convince him or her to seek treatment. If it reaches a point where the addict refuses, family members should be prepared to present an ultimatum. You may not be able to force the addict into treatment, but you can enforce boundaries and consequences with the loved one. You can remove emotional or financial support, or kick them out of the house until he or she is ready to seek help. Some interventions fail simply because the addict is not ready for treatment yet, or because the intervention is not well planned or executed. There are seven principles of a successful intervention. Choose the right people to participate in the intervention. Choose the right time for the intervention. Speak with respect and love, not anger.